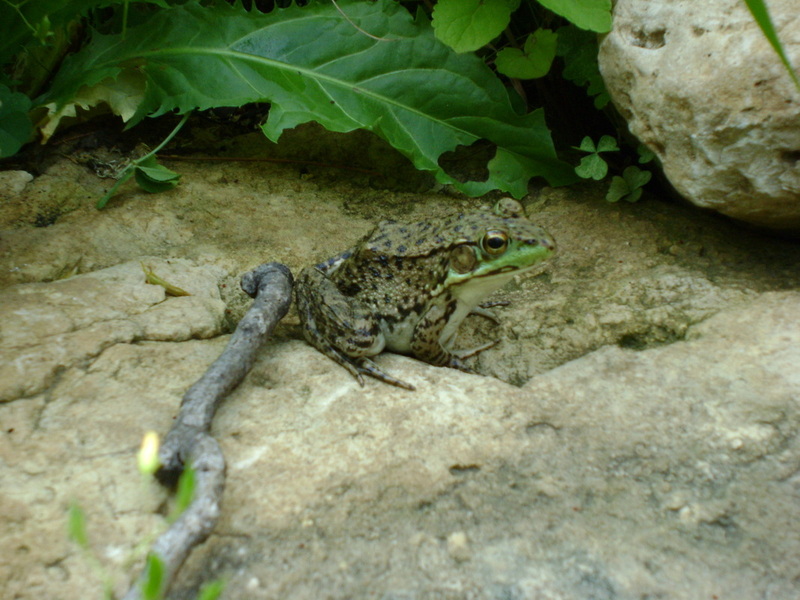 - Why Garden for Wildlife? The web is strong when there are many strands and their ties accordingly complex; break too many strands and it collapses. The base of such a diagram is the vegetation to which all the strands are tied through the animals that eat it. In my botany textbook, the base is sketched as a bit of meadow; in reality, it is the entire landscape - not only my part of it, but yours and everyone’s whose claim to ownership confers on us all the opportunity and responsibility to plant it richly. We are all connected. A hawk may eat a snake that ate a mouse that ate a nut for breakfast, but the beech nut may have come from your tree, the mouse from my field, the snake from our shared wall, the hawk from a hundred miles north, and all of them must be supported on a varied and extensive smorgasbord. We don’t have to - indeed, we neither can nor should - each provide all habitats, every sort of food. You plant nut trees and I’ll plant spruce, you keep a berry thicket and I’ll do the tall grass, or the bog, or the woodlot, the crowds of fruiting shrubs and beds of wildflowers. But let us weave them together into something big enough to matter by connecting each patch with others at the corners and along the boundaries. This is the rich, new landscape; this is the new kind of gardener who asks not whether he should plant this ornament or another but which patch is missing from his community, how he can provide it, and how animals will move from his patch to the next. Like Noah's ark that saved the animals from the flood, I am trying to build a little ark in our tiny yard. Maybe my neighbors will decide to join me, and it will ultimately create significant change. People don't always understand why I want my yard to have bugs, spiders, ants, mice, and other creatures that some people find undesirable. I want to provide habitat to support as much wildlife as possible, of all types, because all life is connected, and if I support other species, I am also supporting myself. If I create habitat for species lower on the food chain, such as worms and insects, then species higher up the food chain can take up residence as well (such as the birds that eat worms and insects). Humans may be at the top of the food chain, but that doesn't mean we can survive by ourselves, it means that we are being supported by all the other creatures lower down. we are ultimately supporting the ecological systems that support us. If you are creating an ecologically sound garden following the permaculture principles discussed on this website, you will also be creating habitat for wildlife, in addition to growing food for yourself. So you'll see several permaculture principles repeated here. I'm going to share what has seemed to work best in our tiny yard. Try to create hedgerows & wildlife corridors: Animals need to get from place to place without leaving shelter or going into open areas. 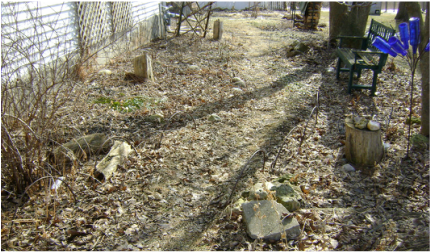 Make sure there is at least a row of bushes or ground cover other than lawn between all the different areas of your yard so small ground animals can move around safely. 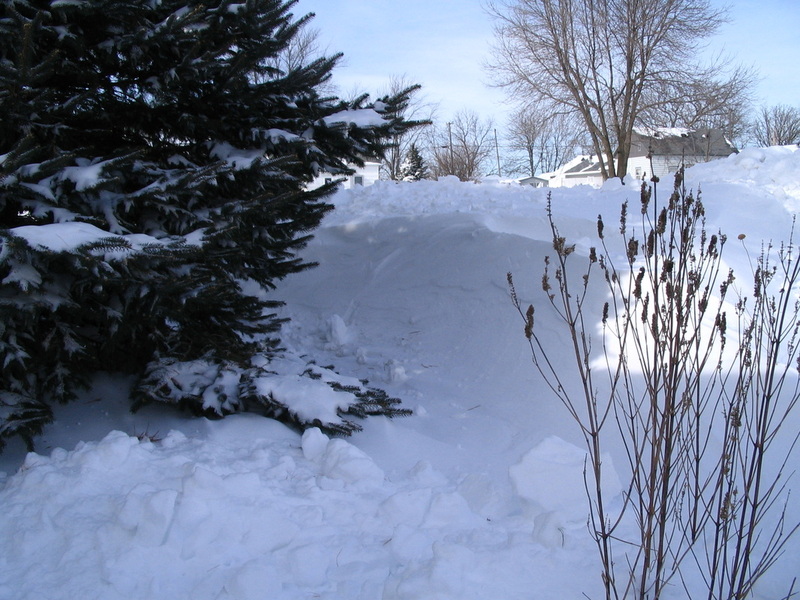 Plant pine trees or evergreen shrubs for the best windbreaks and shelter from storms. 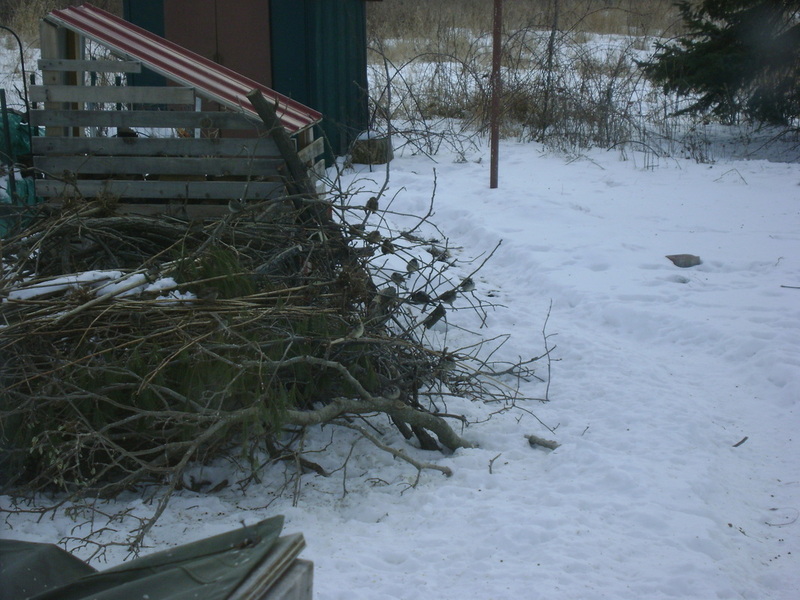 The spruce shown at the top in the photo to the right shelters many, many birds in our yard. Keep gardens looking neat with defined paths, edges, or fences: Some of your neighbors might not like it if you plant a wild meadow or any sort of garden that looks too "natural" to them, even though you would be providing great wildlife habitat. To have the best of both worlds, include a path, fence, or edging in each of your garden areas, and try to keep the path free of weeds. Visually, this will make it look more like a traditional garden. Above is one half of our front yard, which I've kept comparatively tame, in hopes that the rest of the yard won't annoy the neighbors. I planted it with a jumble of of flowers that benefit wildlife, but it still looks acceptable because it is surrounded by sidewalk, along with a small decorative fence, on two sides, with a driveway on the third side, and a foot path on the fourth. 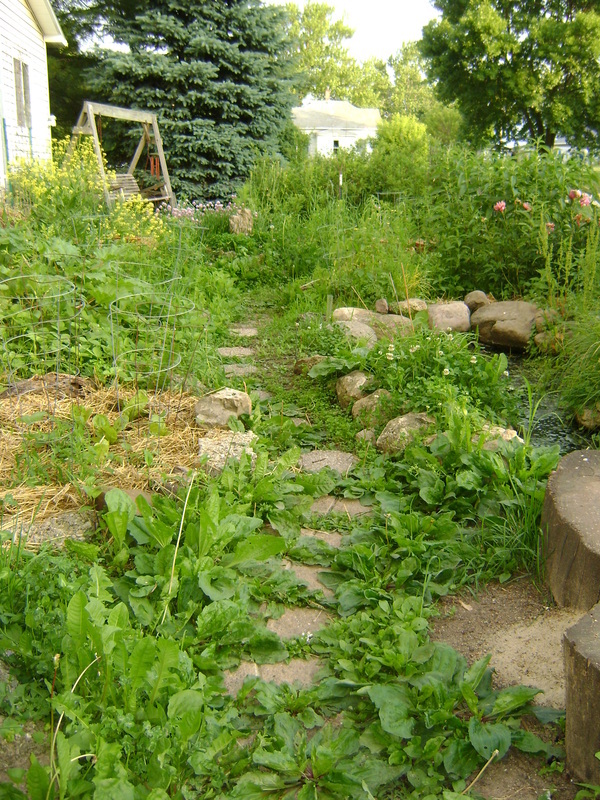 The photo to the right shows our side yard, which gets to looking pretty untamed in the late Summer, but you can see how the path down the middle and the large rocks edging the pond still allow you to make sense of it visually, so it doesn't just look like what might otherwise seem like a weedy mess to some people. You can see that our side garden (in the photo below) provides lots of shelter for animals moving from one place to another, whereas if they have to cross the lawn next door, they will be exposed to predators. 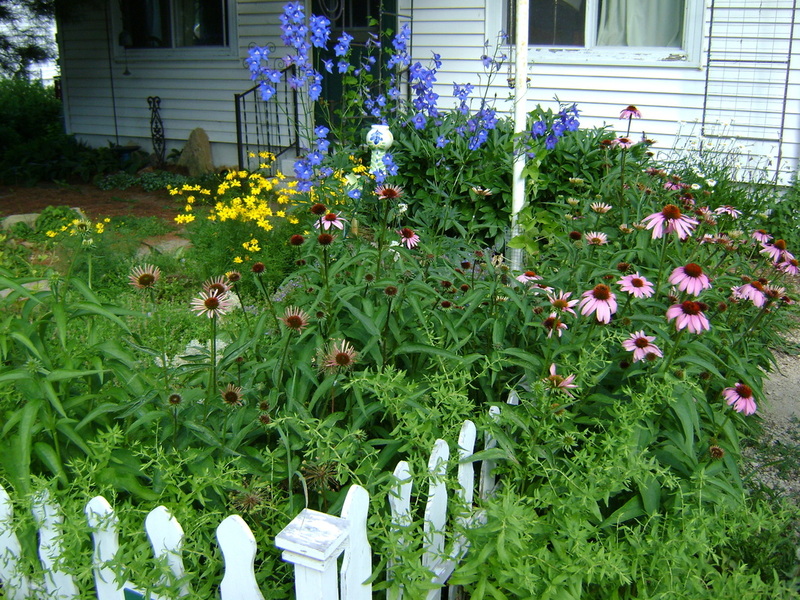 Plant natives as much as you can, they are more likely to benefit wildlife. 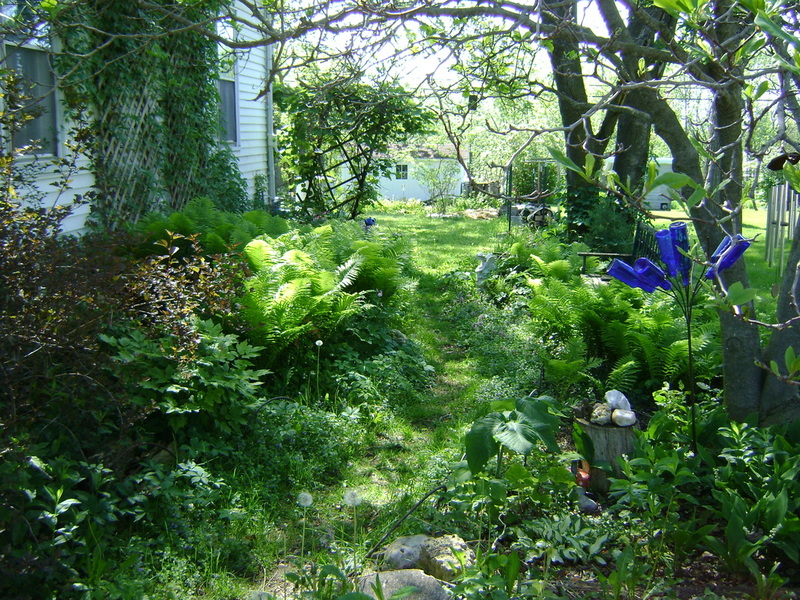 Below is the narrow shade garden on the southwest side of our house, one of the first gardens that we planted. It started out as lawn, except for a narrow bed of tulips, daffodils, and peonies planted by the former owners next to the house foundation. Now it is mostly native plants, including the virginia creeper vine growing on the side of the house (birds eat the berries), baneberry bushes, ostrich ferns, maiden hair ferns, sweet woodruff, hepatica, blood root, bleeding heart, jack-in-the pulpit, wild geraniums, and wild grape vine (on the tilted trellis at the back). This is the garden I walk through every day when Spring returns, to see what's sprouting. Many native shade plants bloom early, because they can get a lot of Sun before the trees leaf out, so this is the first area in our yard to have flowers in bloom. 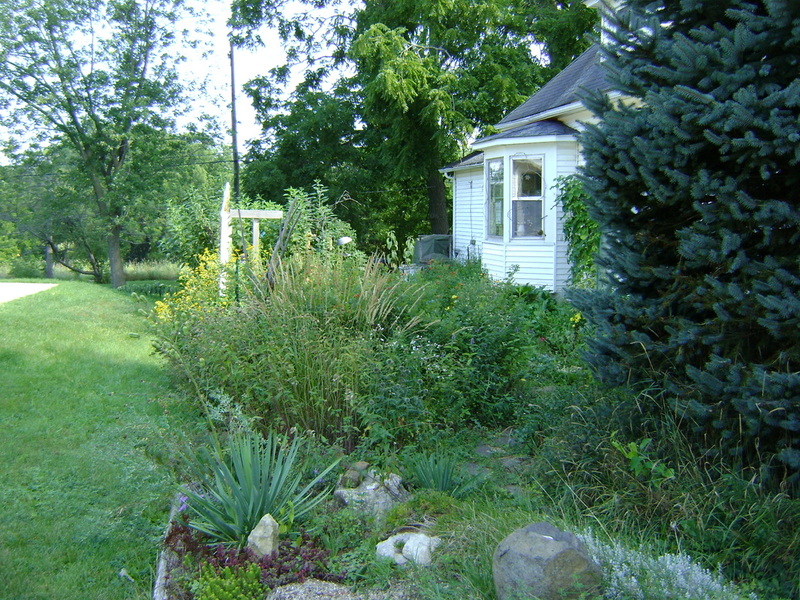 The shade garden in our side yard, planted mostly with natives that benefit wildlife. In our yard, birds enjoy eating the seeds from the echinacea (purple coneflower, below) and the anise hyssop we've planted. Echinacea is great for birds and butterflies, and it can be used medicinally. It stands up well in the wind, looks beautiful, and spreads itself generously. 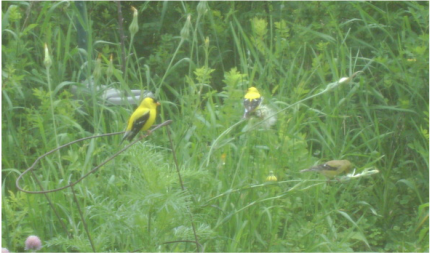 Here's a not very good photo of some goldfinches that I watched landing on these wild salsify plants (an edible). The salsify had flowered and gone to seed. When the birds landed on them, the plant bent over from the weight, and the birds gingerly slid down the stem to reach the seeds. The white flowers of this New Jersey Tea plant are always covered with bees & insects. Rock piles (or rock walls) that are built so that there are crevices between the rocks. Bear and I think rocks are beautiful, so we put as many of them in our yard as we can. 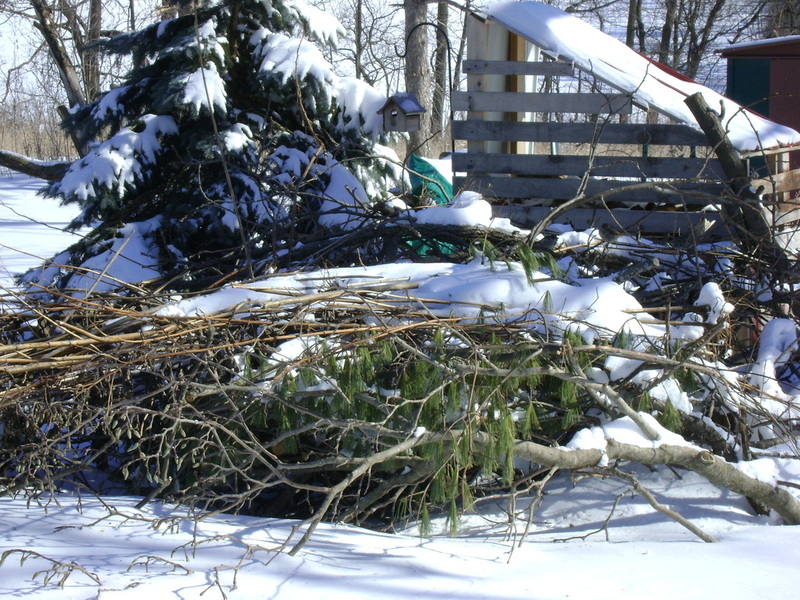 Brush piles/ log piles: You can build one of these by criss-crossing large logs on the bottom, which will create larger hollows, and covering the logs with progressively smaller limbs, leaving as many tunnels and crevices as possible for shelter. You can grow a vine over the pile if you don’t like how it looks. Tree trunks: Butterflies shelter behind loose bark. Mammals dig burrows under the trunk or sit on top of the trunk to eat and look for predators. Snags: Instead of cutting down dying trees, leave them standing. These are called snags (see photo at right). They provide an incredible amount of wildlife habitat. Above & Below: When our neighbors have cut down trees in the past, Bear has asked them if we could have some of the stumps they were trying to get rid of (Bear says it helps to have a large husband that people won't say no too even if they think he's crazy). We've left the tree trunks around the yard in various places. In the front yard (above), we created what Bear laughingly calls "Stumphenge," with three trunks over which vines grow in the Summer (we couldn't afford to buy large rocks to make a Stonehenge). When these got old enough, the bark loosened, providing places in which butterflies and insects can take shelter. 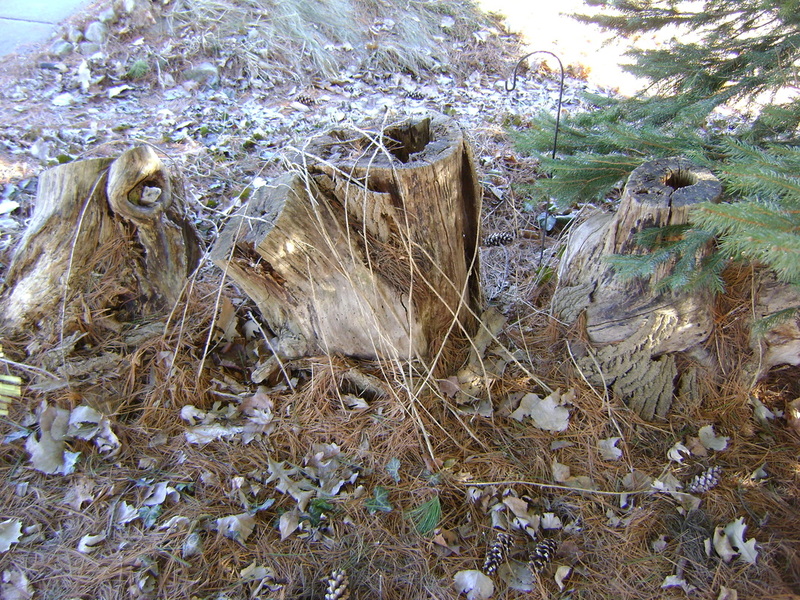 As the stumps decay, they nourish all sorts of other life. 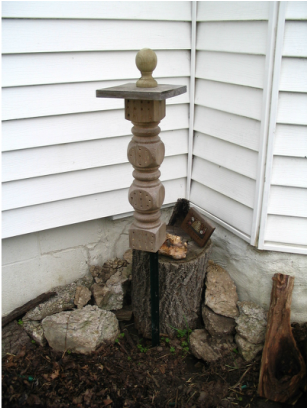 Stumps also can do double duty as small end tables in a seating area, or to display garden figurines. We've also seen pairs of baby squirrels using them as a jungle gyms while chasing each other around the yard. if they become big enough. Make your own snag (above): If you don't have any dying trees in your yard, but can get a large tree limb, you can anchor it in the ground and make your own "snag." Dig a hole, insert the trunk, and fill in around the trunk with rocks and soil. As soon as we put up the snag in the photo above (it's behind the white sack sitting in the rain garden we're creating), birds started using it as a perch. 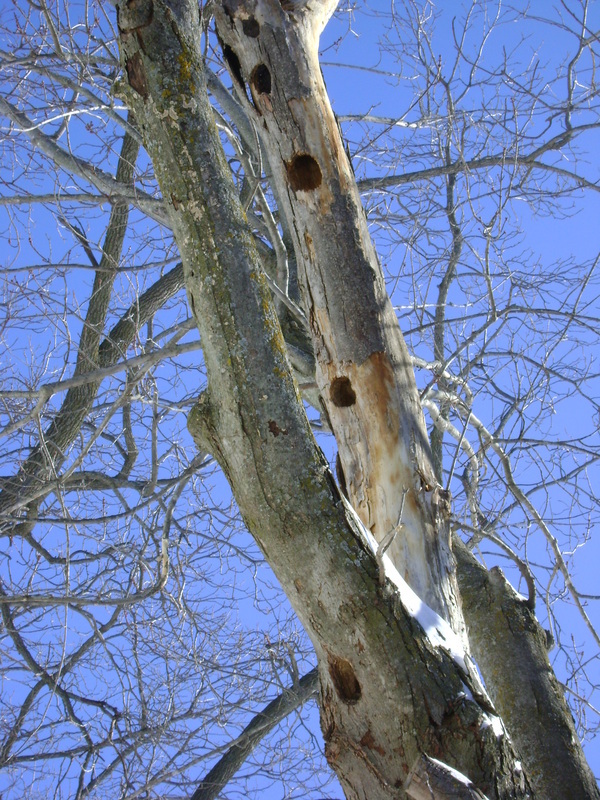 It's not big enough to provide nesting sites, but the birds do search for insects in its bark. 1. 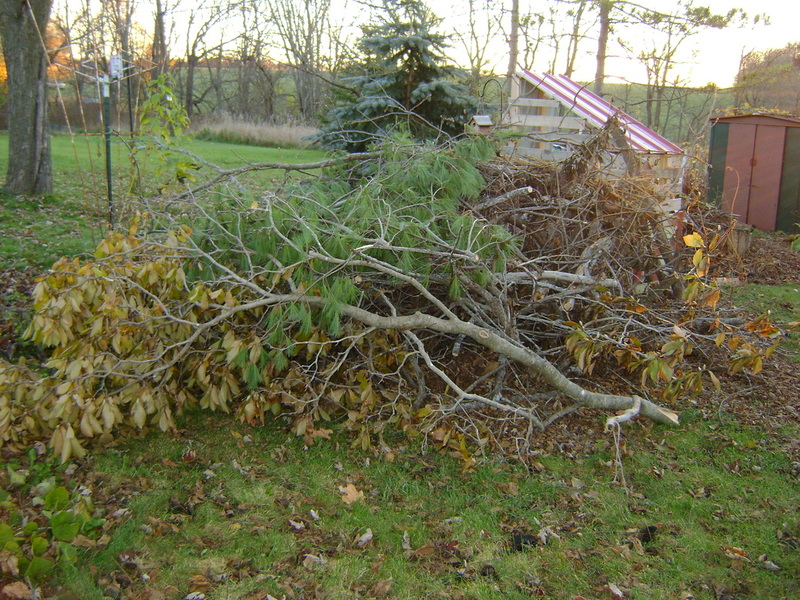 We trimmed some trees in the yard in the late Fall, and temporarily moved the cut limbs to this pile. We didn't attempt to arrange it in any particular way, nor did we plan to leave it there long. However, the birds took it over almost immediately, so we decided to let them keep using it. 2. When we harvested our sunchokes, we put the dry stalks over the top, which held some of the snow on top of the pile and provided even more shelter from the elements. 3. The back side of the pile ended up with lots of open spaces underneath. This keeps the birds out of the wind since the pile backs up against one of our wood sheds. 4. It's hard to go outside and take a picture of the brush pile without all the birds that are using it flying away, but here's a couple taken through our back door. Dozens of sparrows, goldfinches, and juncos shelter in the pile in between eating at our bird feeders. 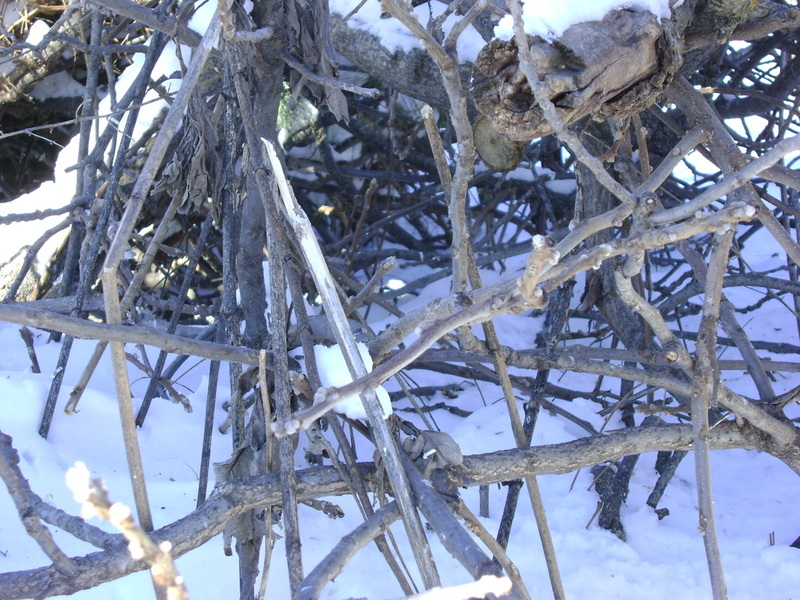 If you're wondering how a pile of twigs provides shelter, take a look at the image below. 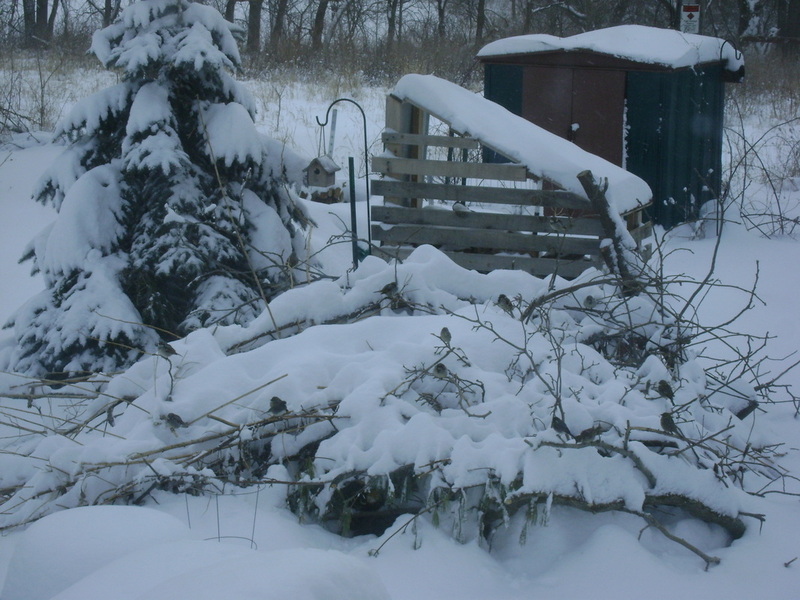 It shows a hawk sitting on the edge of the brush pile, looking for its next meal. It was too big to get into the pile, which was full of dozens of small birds at the time. The hawk sat there waiting until a few of the birds left the pile, and it was off after them. Then a few minutes later, a lot more birds left when it was safer. Clean in the Spring, not the Fall: Don’t remove all the dead plants from your garden until Spring, so bugs can hibernate in the hollow stems and birds can pick out the last of the seeds from the dried flower heads. Leave Leaf Piles: Bugs also hibernate in mulch or leaf piles, so leave some undisturbed all Winter. Grow Pine Trees: Birds need evergreens to shelter from the wind in Winter. Plant as many as you can. The birds will reward you with a chorus of songs every morning when Spring returns. Our blue spruce below shelters dozen of birds year round. Leave the leaves where they fall, to provide shelter for wildlife over the Winter. Evergreens shelter birds from the Winter wind. 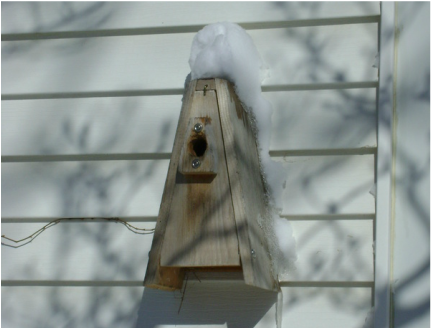 Birds may also use nesting boxes as shelter during Winter storms. 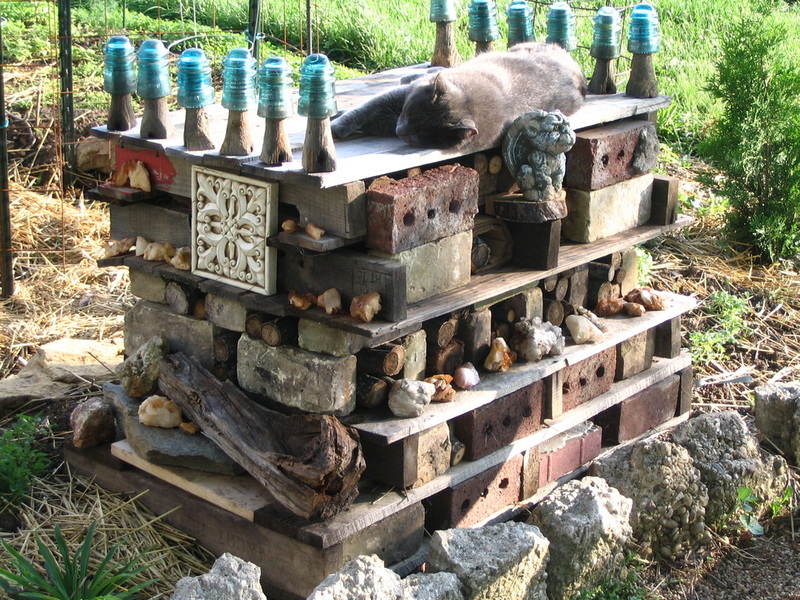 I learned about habitat stacks from some British gardening books. I think they might be popular there. I love to build them because they are both functional and artistic. They provide dry nooks and crannies that shelter various bugs and small animals during the Summer and provide hibernation spots during the Winter. I love the way they look in the yard. Bricks make a stable first layer: Bricks will support the rest of the stack. Arrange them on the ground like a maze- leave tunnels in between the bricks for small mammals to use. Many of our chipmunks have been saved from cats by hiding in these tunnels. 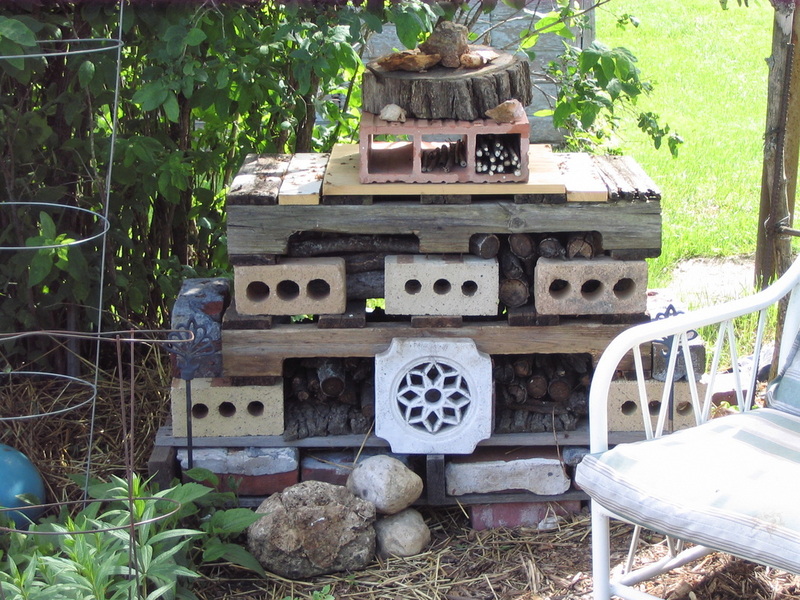 Pallets: We used pallets to create the upper layers in our habitat stacks. Each layer of pallet can be filled differently to provide different habitat: We filled ours with straw and leaves, or with corrugated cardboard rolled loosely into logs (which provides many layers of habitat- you can see this in the second to top layer in the left photo below). Small logs: Pallets can also be filled with small logs interspersed with bricks. If you drill some deep holes in the end of the logs, bees can use them to lay eggs (see more about bee nesting sites below). The top of the stack also provides a good sunning location for cats. I often find piles of walnut shells here too, from squirrels having a snack. so we need to keep them around. Many honey bees are dying from colony collapse disorder, the cause of which is still unknown, although pesticides and diminishing habitat are believed to play a role. 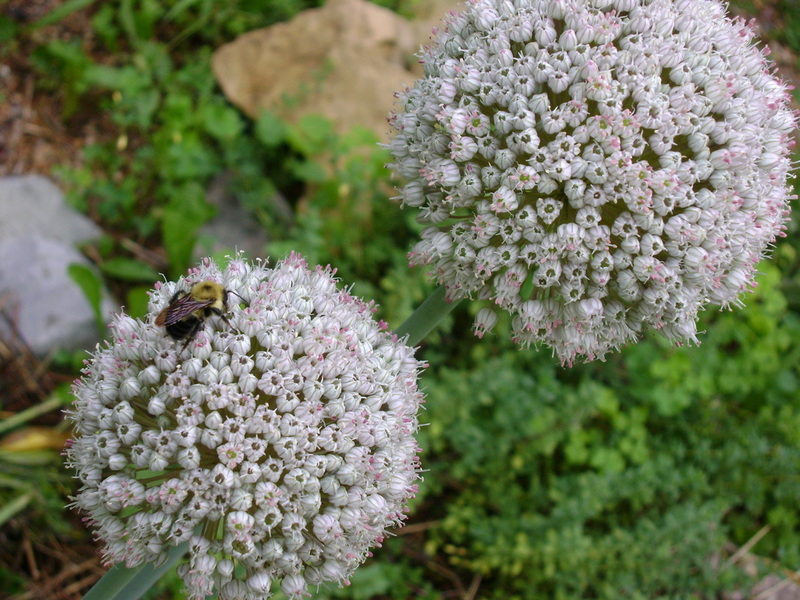 You can help save the bees by providing the flowers and habitat they need. There are over 4,000 native species of bees in North America (honey bees were imported from Europe). Most native bees do not form hives. 70% live in the ground in old tunnels, in tree snags, or similar places. Most are non-aggressive. Most rarely, if ever, sting. Many have no stingers at all. You can build a bee nesting site by drilling holes into a thick piece of untreated lumber, such as a 4'x4' or 4'x8'. Bees will lay their eggs in the tunnels in Spring and seal them with mud. The new bees will be born the following Spring. Drill holes in the lumber ¾” apart. Holes should be of various sizes between 3/32”-3/8” to accommodate different types of bees. Holes less than ¼” wide should be 3-4” deep. Larger holes should be 5-6” deep. Holes should not go all the way through the lumber, they should instead only be open on one side. Put a “roof” on top that sticks out to protect the holes from the rain. Houses are best placed in a sheltered location with at least morning sun, 3-6’ off the ground, with a soft landing spot in front of them for when the bees emerge. You can also drill the holes mentioned above in any tree stumps you have in the yard. If you're not feeling handy, you can buy bee houses that have nesting tubes that can be replaced annually (this also protects from parasites). Check for these in garden catalogs. If you can leave bare ground on a south facing, gentle slope, it may be used by ground nesting bees. 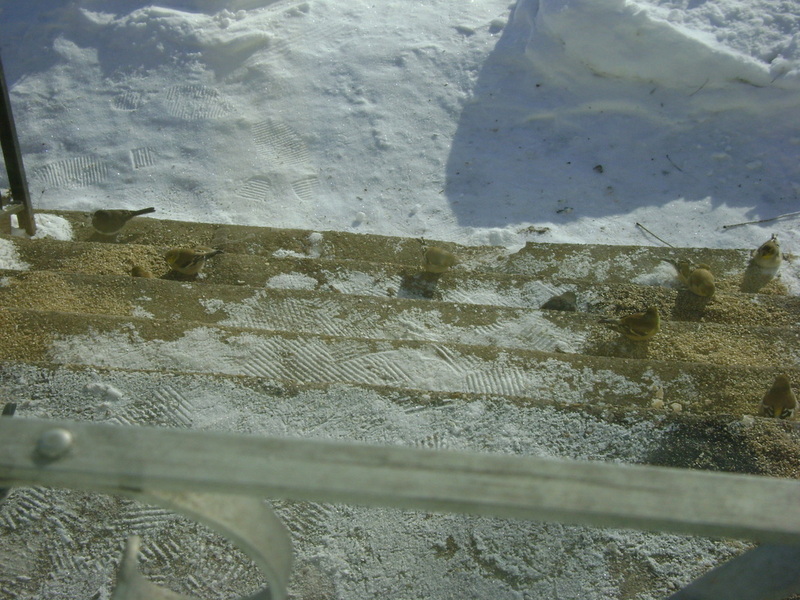 The year we put in our catio, the sloping ground inside it was bare from the construction. We quickly saw small bumble bees digging in the soil, making tunnels. I love being near flowers when they are so full of bees that I can hear the humming and watch all the movement. 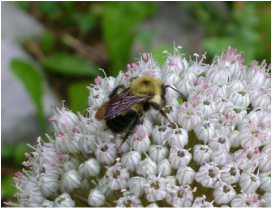 We have lots of bumble bees of all sizes in our yard. They remind of us small teddy bears that look so soft we want to try to pet them. They fly around so fast, landing on a flower, moving in a quick circle around its center, and flying on to the next flower. Over and over again... busy as a bee. One morning I was outside at dawn and found bumble bees sleeping upside down under our bee balm flowers (above). I've also noticed them under onion flowers. I am trying to grow some maypop passionflower vines for the same reason- in addition to providing fruit for us to eat, bees are supposed to sleep in the flowers. 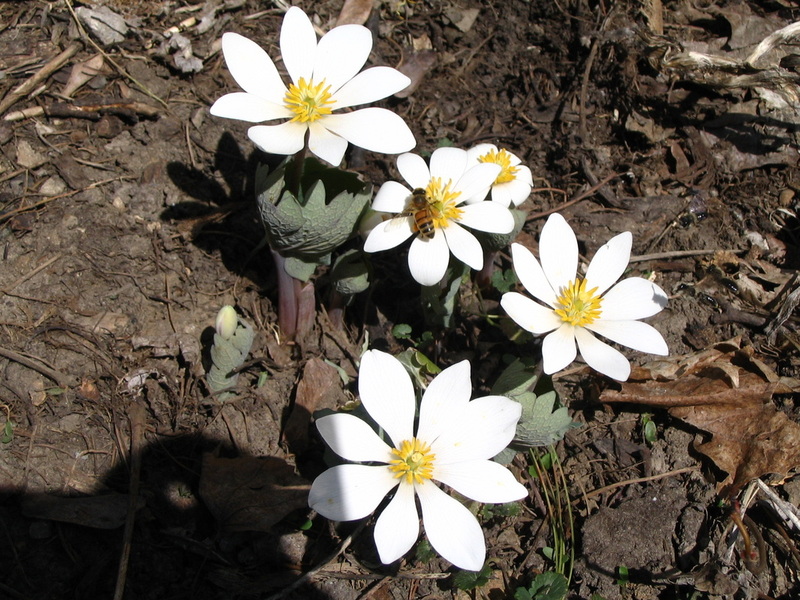 A bee feeds from blood root, one of the first flowers to bloom in our yard. 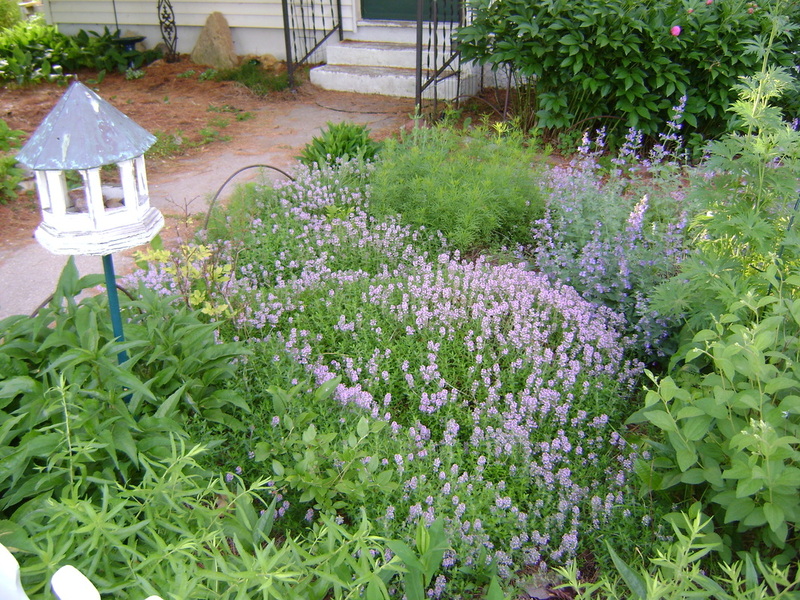 A carpet of thyme in our front yard, with catmint blooming behind it on the right, both of which are always full of bees. 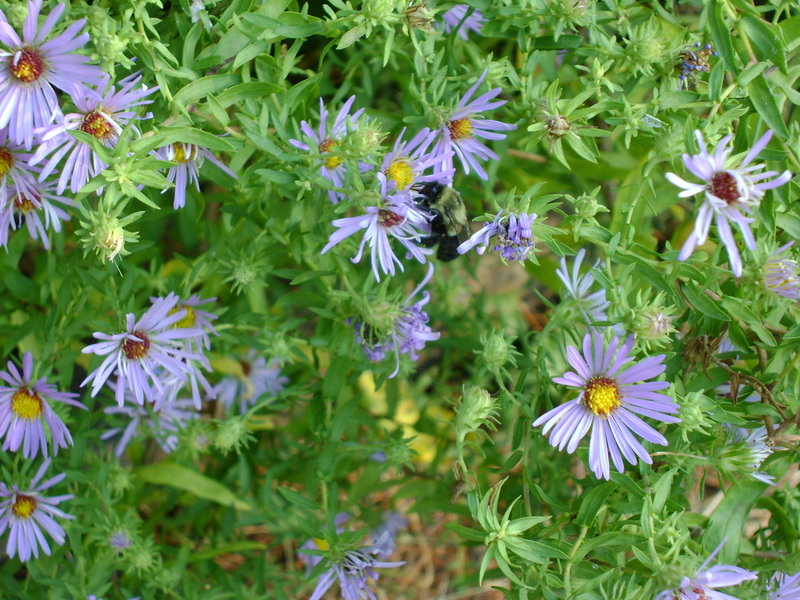 Our Fall asters visited by a bumble bee. Butterflies are also fun to watch ambling around the garden. They add so much movement, it makes the garden seem even more alive. I find it very difficult to photograph them, though. They just don't hold still long enough. I seldom find them with their wings open as they are in the photo to the right, which is a shot that Bear was able to get. They're hard to identify for the same reason- it helps to see the markings on the top of their wings, but they seldom hold still long enough with their wings open. To create habitat for butterflies, you need to provide nectar plants for butterfly food. You also need host plants on which they can lay their eggs and on which the caterpillars can feed when they hatch. Some species of butterfly have only one type of host plant, so are very threatened by habitat reduction. Butterflies (and bees) feed more easily from flowers that have a single layer of petals. Some plants that are good for butterflies in southwestern Wisconsin include: milkweed, nettle, plantain, butterfly weed, purple coneflower, sedum, yarrow, coreopsis, poppy, hackberry trees. Butterflies need locations to take shelter from the wind and sunning locations in the morning where they can sit until the dew evaporates off their wings. Butterflies shelter in small nooks in hollow logs, stone walls, and behind loose tree bark. 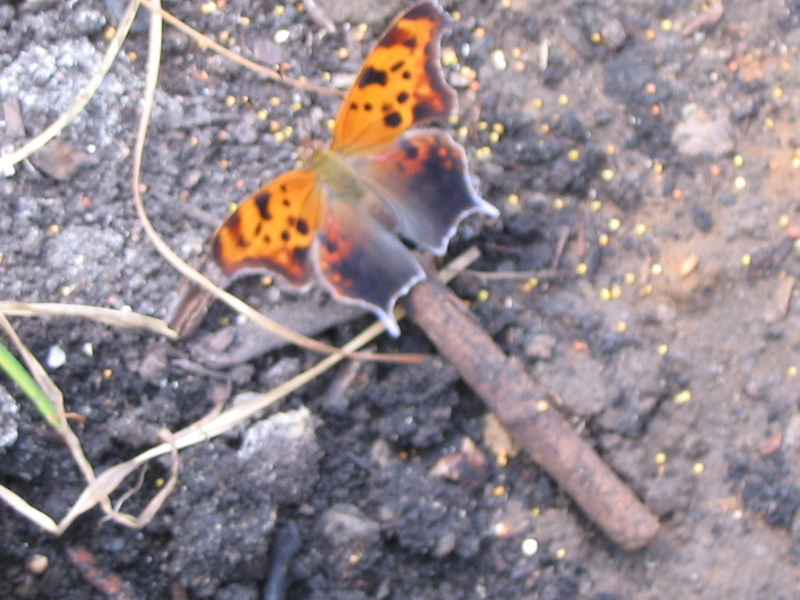 Butterflies will gather at mud puddles (called puddling) to drink the minerals from the mud. Muddy areas also benefit birds and bees that use mud for nest building. To the right is a muddy area I created in my yard by turning a metal trash can lid upside down and filling it with sand and soil. When it rains, it stays muddy for a few days. The logs that surround it have hollow areas that would be good shelter. Unfortunately, I've never seen any butterflies using this area. Buy feeders that are very easy to take completely apart, so you will actually clean them. The ones in the photo to the right are the best I've found so far. If you don't keep them clean, you may be spreading diseases. Recycled plastic feeders are easier to clean than wood and last longer, although they are more costly. Large tree trunks are good for spreading out seed for ground feeding birds. The tops of the trunks are easy to keep clean. Usually the rain will wash them for you, or they are easy to shovel off in the Winter. The manufactured ground feeding trays I've bought all had lips around the edge (like the hanging one on the right). It's very hard to clean out the corners of these, and the shovel doesn't fit into them. Birds will sort through seed mixtures, eating only what they like and leaving the rest to rot on the ground and making a mess you need to clean up. Additionally, the cheap seed mixes may not save any money because the birds go through them faster (as they search for their favorites) and you may end up putting out more. I feed 100% dehulled sunflower chips. It cost me about $40 for a 50 pound bag (that I buy from Mound's pet store in Madison). It's expensive for our budget, but almost every morsel gets eaten, and there's no shells to clean up off the ground. You can also buy “no waste” bird seed mixes to reduce mess under feeders. They usually include a mix of seeds without hulls. Some people only feed the birds during the Winter, but if you put out birdseed in the Summer too, parents will bring their babies to the feeders. You'll be able to see baby birds sitting right next to bird seed, begging for their parents to feed them, having not yet learned that they can pick up their own seeds. If you watch birds a lot, consider joining Project Feederwatch (Feederwatch.org) through Cornell University. People across the country report the birds that come to their feeders during the Winter and scientists use the data to track bird populations. I've seen similar citizen science projects for tracking mammals, bees, nesting birds, and plant flowering times. We're equal opportunity feeders in our yard, and don't care if the seed is eaten by the birds, the squirrels, the chipmunks, or the mice. 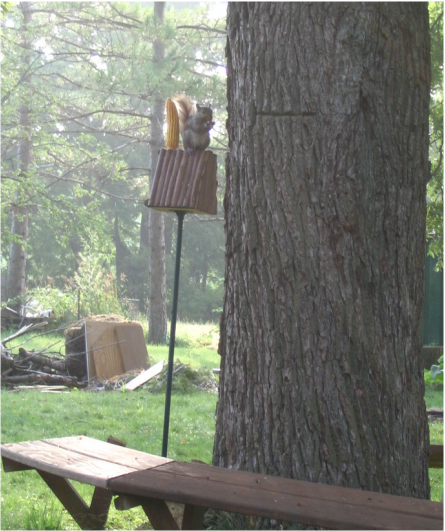 In a different part of the yard I do put out corn for the squirrels (below) to give the birds more of a chance at the bird feeders. 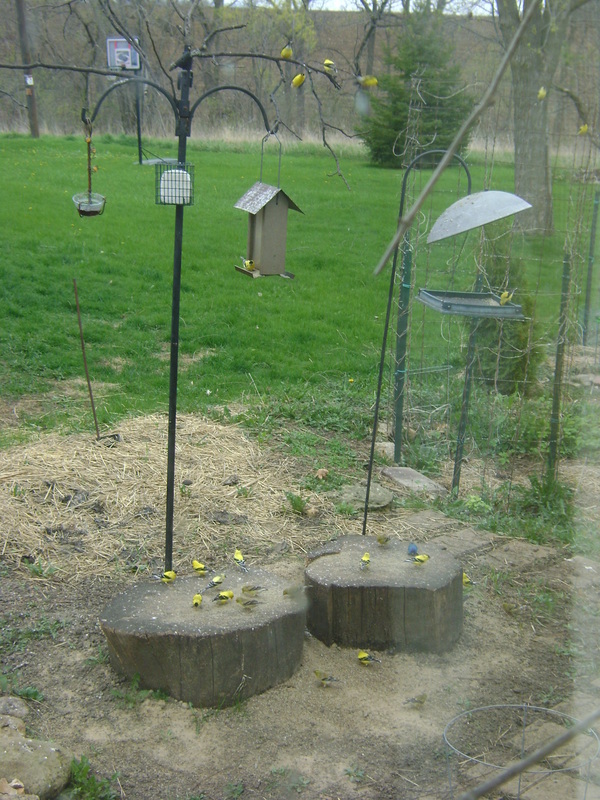 The bird feeding area in our yard in early Spring, with gold finches and one indigo bunting. 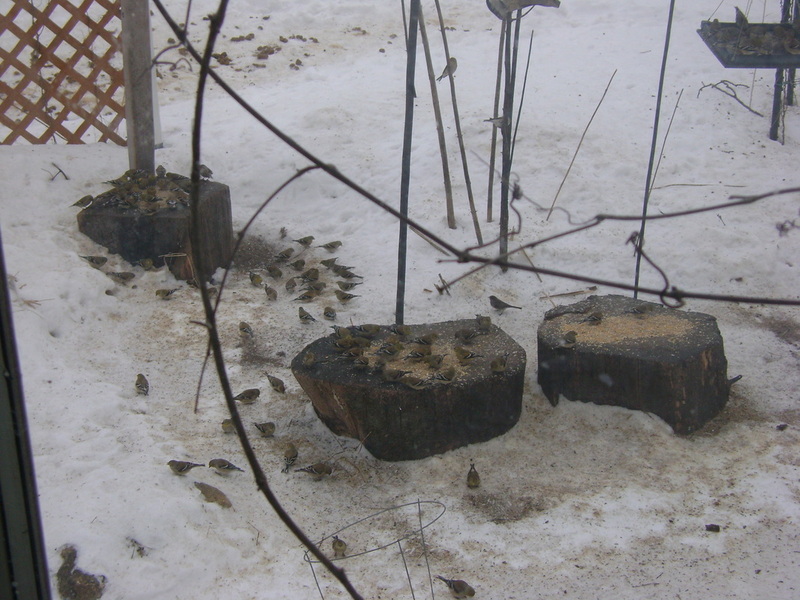 Here's the same feeding area during the Winter, with many more gold finches in their dull Winter colors. 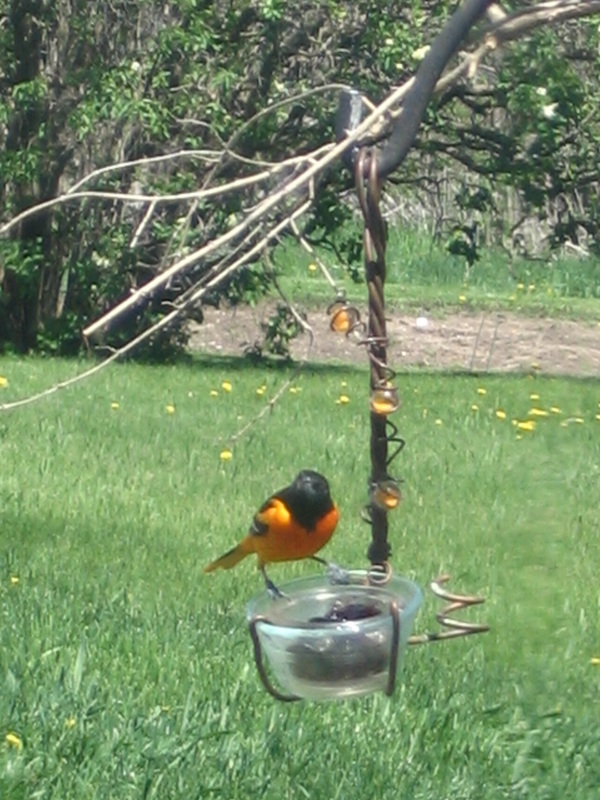 Baltimore orioles (the orange bird to the right) will eat grape jelly from this specially designed feeder in our yard. When the birds return each Spring, the local grocery stores sometimes run out of grape jelly. which is sheltered from the North wind. This may be the most important thing you can do for wildlife, because it may be the hardest thing for them to find in inhabited areas. As such, it may bring more animals to your yard than anything else you could do. You can put out a bird bath, of course. When I first moved into our house, I wanted one really badly, but they were all too expensive when we were facing major renovation bills. I got really angry driving around seeing everyone else who had these beautiful bird baths in their yards, but they were only for decoration- they didn't even keep them filled with water! Eventually, I gave up on wanting a fancy bird bath and got something more practical. I bought one of those trays that you put under flower pots to catch the excess water when you water the plants. I got one that was a couple feet wide and a couple inches deep, made of terra cotta, for less than $20. I just put it on the ground, because then the chipmunks and squirrels could use it too. I put a flat rock in the middle, as a place for the birds to land. I filled it every day, and had to scrub it out often to keep it clean. 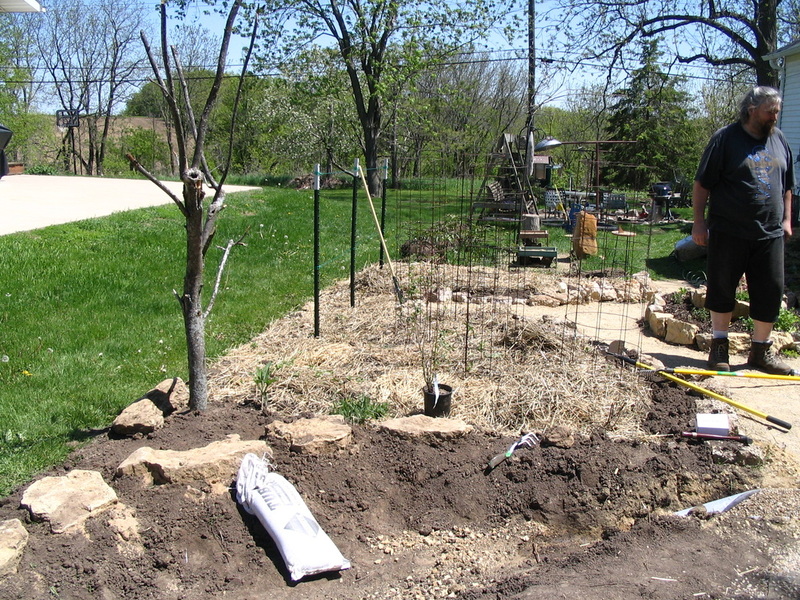 You can also put smaller shallow dishes filled with rocks within your veggie garden or in a rain garden (above). These fill with water when it rains and it's there for a couple days as a source of water for insects. 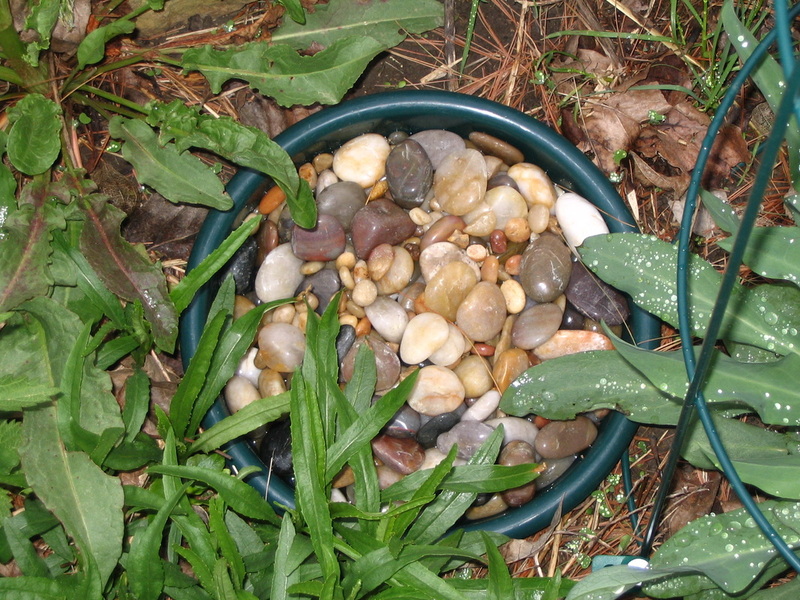 You can also use edging rocks that have small pits that will collect water when it rains. 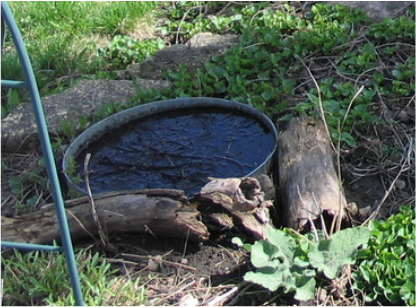 It's a lot of work to fill a bird bath every day, and keep it clean. 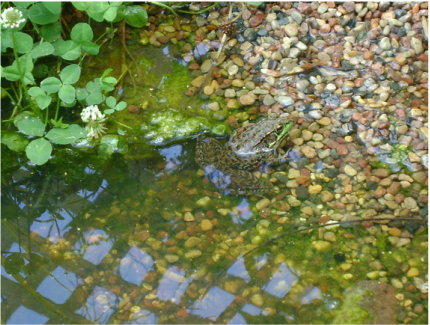 Eventually, we put in a small wildlife pond, which in addition to providing drinking water, has let frogs and dragonflies move into our yard. 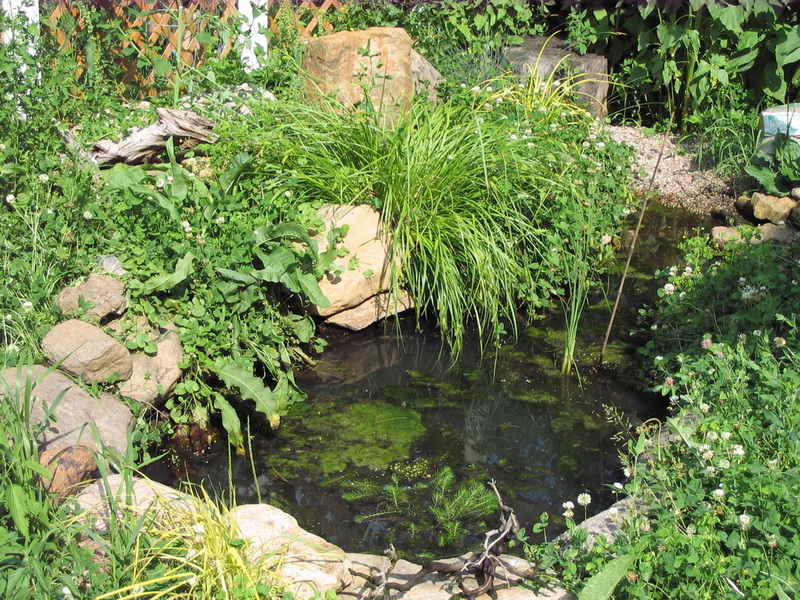 See how we built our wildlife pond. 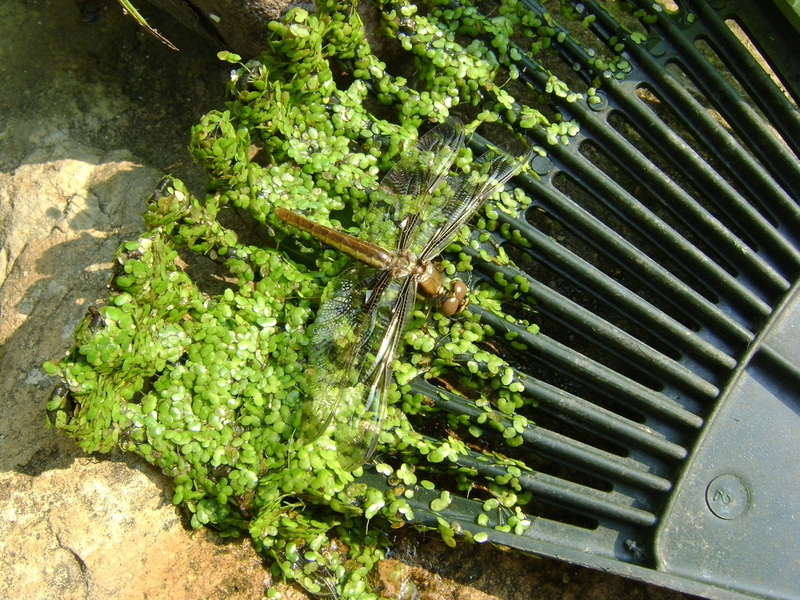 We saw dragonflies laying eggs in our pond within a couple weeks of building it. You can put up as many bird houses as will fit in your yard. Don't put them too close together, because most birds need a certain amount of territory to themselves for nesting (which they declare in their songs). 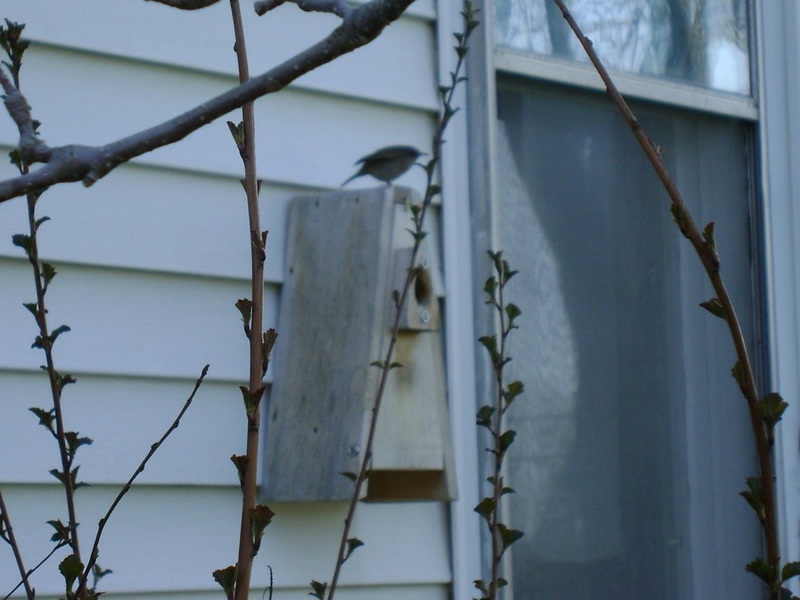 Different birds need different types of houses, with different sizes of entrance holes. When you buy one, it will likely indicate which type of birds will use it. Above is a box for wrens, one of which is standing on top of it. A pair nests in our yard every Spring, and if they didn't, I would really miss their joyful song. 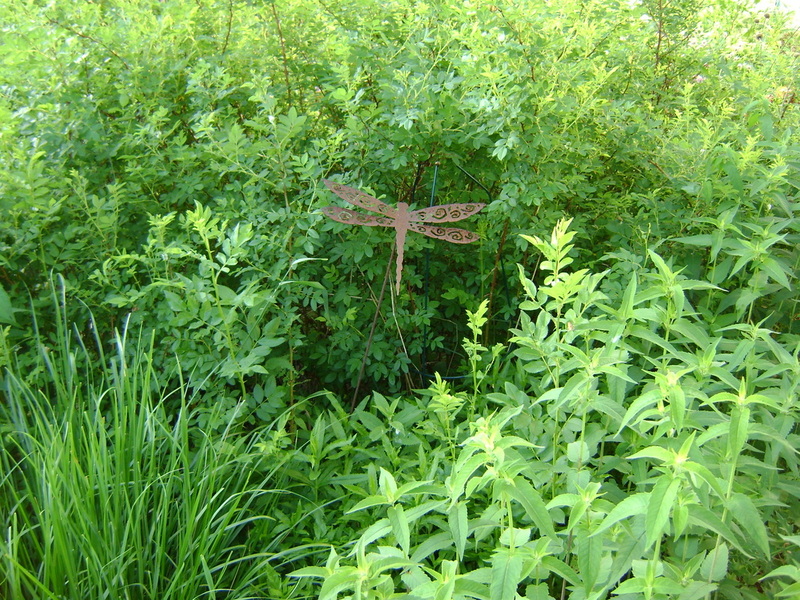 Above is a photo of our rose thicket (behind the metal dragonfly). Ours probably isn't big enough for a bird to be comfortable nesting in it, but if you have room for a larger thicket, the thorns on the roses provide a good defense against preditors. 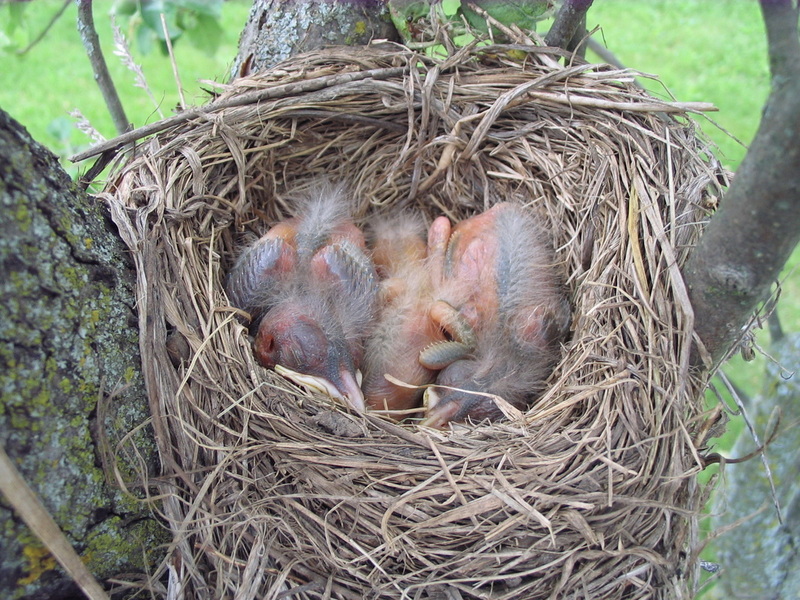 Trees are preferred nesting places for many birds, so let's all plant more trees! 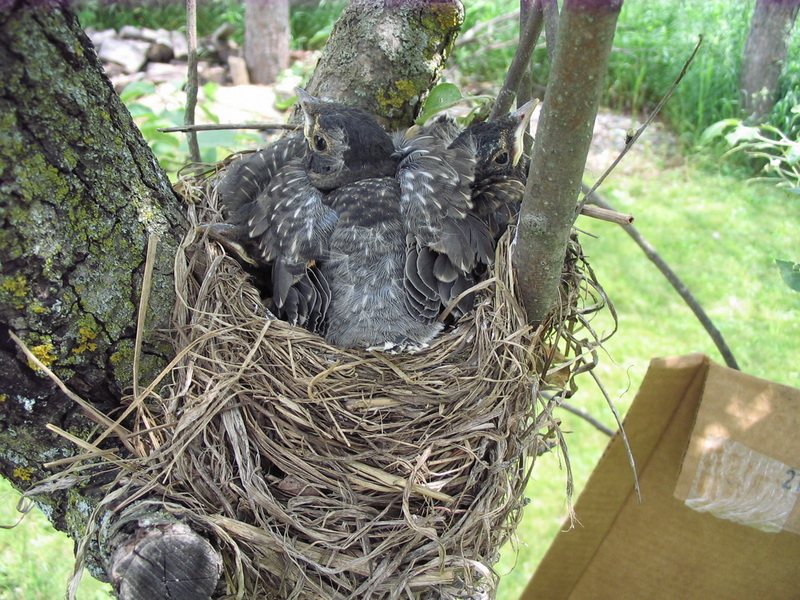 Below is a robin's nest built in a fork of our neighbor's apple tree. It was very low to the ground, which let us take these great photos, but it would have been easy for a cat or racoon to walk right up to the nest and kill the birds. I tried tying some cardboard around the tree limb to block access, but it didn't survive in the wind. Fortunately, the birds stayed safe without my help, and eventually left the nest. 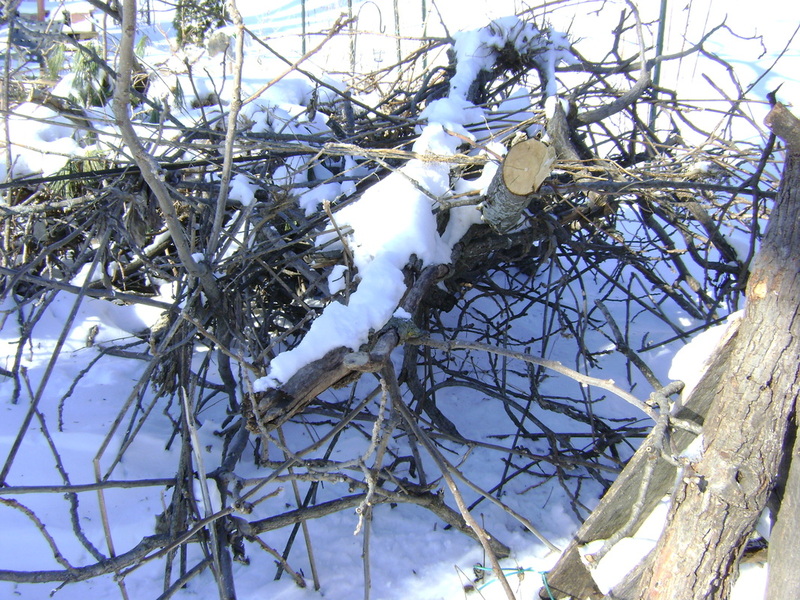 Large vines can also provide nesting places for birds. 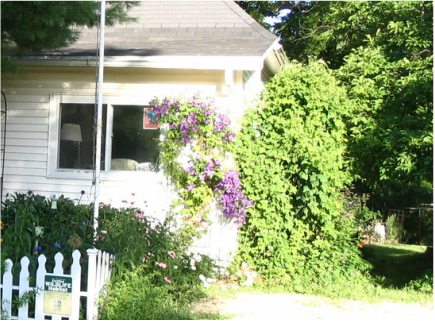 The above vine on the front corner of our house is a native clematis (clematis virginiana, unfortunately not the one with the large purple flowers, but the large green mass to the right of them). Sometimes we see robins nesting in the top of it (or our cats notice it first and we notice them hanging out at the window below it). Beware though- I chose a poor place for this clematis- it grows out of control and would be better in the back forty (if I had one) where it could grow unimpeded. I have to trim off half of it each Spring to keep it in control. It also spreads freely (from some really cool looking, tuffty seed heads) and I've had to kill baby clematis plants all over the yard. The purple clematis flowers on the left are a jackmani clematis- they're not part of the native clematis, which has uncharacteristically small (white) flowers. The snag at the right, already described above, also provides nesting sites that the birds fight over in the Spring. If you've gone to the trouble to include wildlife in your gardening plans, consider certifying your property as wildlife habitat through the National Wildlife Federation (nwf.org, see their wildlife gardening section). 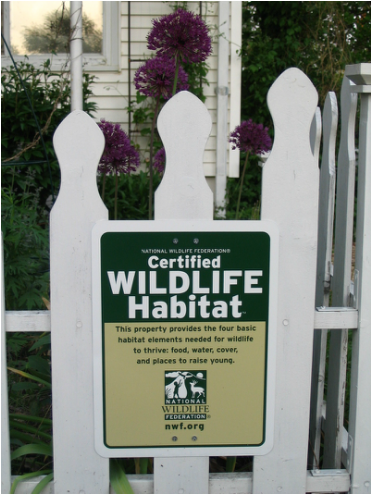 Then you can post this "wildly" popular sign in your yard and help spread the word that providing and preserving wildlife habitat is important. The certification program has been in place since the 1970s, and almost 200,000 properties were certified by this writing in 2015. You can apply online for certification. When I applied there was a $20 fee, which also makes you a NWF member for a year. You also need to buy your own yard sign. Different versions are available. This one cost $30+. This is the first book I used to decide what to plant for wildlife in our yard. It includes a 100-page plant directory, with detailed information about how to grow each plant and what wildlife it benefits, as well as a full color photograph of each plant. 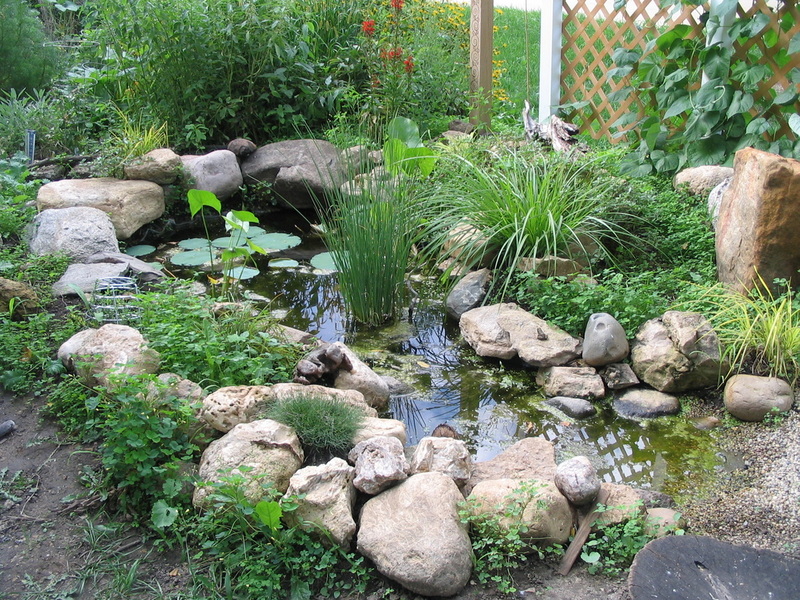 This is my favorite resource for inspiring ideas about creating wildlife habitat. It has lots of great how-to information and photographs, as well as details for getting your yard certified as wildlife habitat (although the NWF website has the most current criteria). If you live in Wisconsin, this book will help you integrate native plants into your home landscape. The descriptions of each plant include notes on which are beneficial for wildlife. How to Make Wildflower Meadows, Ponds, Hedges, Flower Borders, Bird Feeders, Wildlife Shelters, Nesting Boxes, and Hibernation Sites. This is the British gardening book that taught me how to make the habitat stacks described above. It's also full of great photos, lots of information about planning your landscape, and directories of common wildlife and the plants that benefit them. Landscaping for Wildlife. Nongame Wildlife Program, Minnesota Department of Natural Resources. By Carrol L. Henderson. 1987. Another good book that outlines the basics of what is needed to landscape for wildlife habitat, including applying it to larger properties. A database of native plants that can be searched by state and includes information about wildlife uses for each plant. Another database searchable by state that includes a wildlife tab for each plant describing how useful it is. As mentioned above, this website includes tips for creating wildlife gardens in your backyard, as well as lots of photos from people who've done it in their yard. and rewards us with the joy of observing wildlife in our own yards.